Part of Coastlines exhibit on the stage at Artcraft at Mahon Hall. The realities of living in a community that’s accessible only by boat are brought to the surface at Artcraft this month, where Joanie Paterson’s Coastlines show takes inspiration from local shipping history. With some help from fellow islander Alison Sparshu, Paterson has created a show that combines artistic expression with research. The result is an engaging point of entry into life on coastal British Columbia as experienced from 1899 to 1937. It’s a history lesson that could easily appear in a regional museum but has the added spark of a deeply personal interest that’s evident in the artworks on display. The Mahon Hall stage appropriately finds itself home to a set-like installation of items that would have been sent by ship to the coast’s remote settlements. 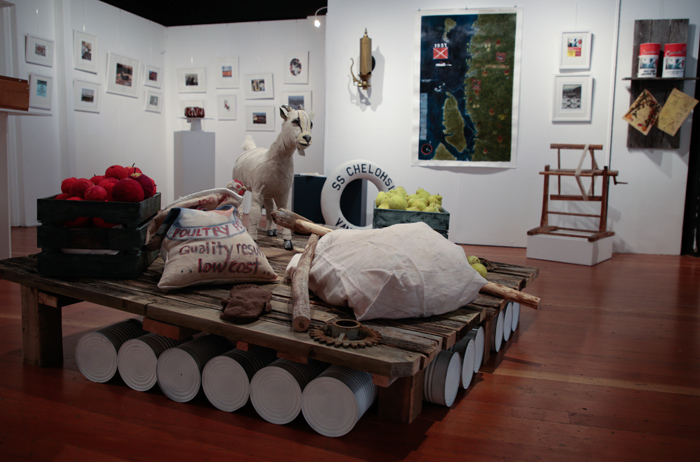 A wooden raft created by Sparshu is the base for life-sized textile sculptures such as a small goat, a chicken and wooden crates of felted apples and pears. Other touches that help transform the setting include a replica ship’s steam whistle made by Sparshu and the intermittent sound of the whistle piped in via laptop. Paterson’s prints form the major part of the show, and depict imagined scenes gleaned from her research. Various vessels from the Union Steamship Company that ferried passengers and goods get star treatment, viewed as if on their coastal journeys and accompanied by interesting factual tidbits. For instance, viewers learn the Cassiar was nicknamed the “Logger’s Palace” and was equipped both with a bar and a jail cell for its trips to logging camps. Coastlines runs daily at Mahon Hall to Aug. 22. Hours are 10 a.m. to 5 p.m.
For more on this story, see the August 8, 2018 issue of the Gulf Islands Driftwood newspaper, or subscribe online.